A new hot custom fidget spinner with an optional full color logo. The hottest toy is now the hottest promotional product. 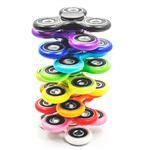 Our fidget spinner is made of strong and durable ABS plastic with steel ball bearings in the center for smooth spinning. Great way to relieve stress and eliminate boredom. Not intended for children under 6. On sale. Stock is limited. The hottest toy is now the hottest promotional product. 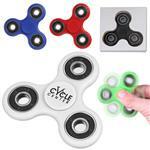 Our fiddle spinner is made of strong and durable ABS plastic with steel ball bearings in the center for smooth spinning. Great way to relieve stress and eliminate boredom. Not for under 6 years of age!